You can import multiple new users onto the system at once. These users can be imported in and you can even import them into a Role and a Group. You need to know three key pieces of information to import users correctly. On the People Page you can add in multiple users at once by importing them in. 1. You MUST format the spreadsheet correctly. Zoom: 1. You MUST format the spreadsheet correctly. You must format your import spreadsheet correctly. We recommend the following layout. Please see the Administration lesson on Importing Multiple Athletes/Professionals before you attempt to import multiple users into the system. 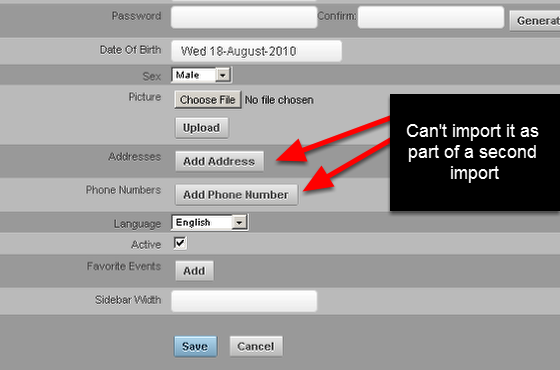 If you do not have a password, or a date of birth field, or an e-mail field it blank, the import will fail. 2. Once you import in new users, you cannot override their personal details (e-mail, username, dob, address etc) with another import. 3. If you know that you need to import in users to update groups or roles in years to come, ensure you use a standardised username layout. If you are planning on updating your groups and roles each year by doing an import to update their groups and roles, always use the same username format to avoid accidentally adding in duplicates to the system. If you use first.last name (jamie.anderson) one year and then you import in some users with different case First.Last (Jamie.Anderson) the system will recognise this as a different user. Please be consistent to avoid a lot of duplication checks!!! !